NEW --- From MediNiche Pharmaceuticals and the Makers of OcuDerma®, eye gel. The 1st Step to Longer, Thicker, Healthier Lashes and Brows --- Introducing LASH ADVANCE®, a non-prescription cosmeceutical for Optical Dispensaries and Professionally Recommendation. 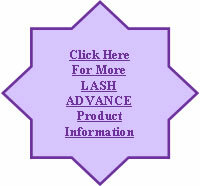 • Vitamin, botanical and lash enhancing ingredients help strengthen, protect and revitalize eyelashes in 2-4 weeks. • Featuring PeptiPlex™, advanced peptide complex, supports the natural, renewal cycle of lashes so they look lush, healthy and rejuvenated. • Defends against damage by hydrating; minimizes breakage. • Helps lashes recover from environmental, chemical and physical damage and return to a healthy state. • Appropriate for upper lashes, lower lashes and sparse or thinning brows. • Drug-free; does not contain bimatoprost, the active ingredient in LATISSE®. Will not darken eyelids or change iris pigmentation. • No parabens, fragrances, colorants, petroleum products, or propylene glycol. No known allergens: gentle for sensitive eyes. • Developed in conjunction with Optometrists and Ophthalmologists. Doctor tested and clinically evaluated; professionally endorsed. * pricing for doctors and their office staff only. 4) Fill out all fields in the form below and click "Submit"
Copyright © 2003-2017 Mediniche, Inc. All rights reserved.